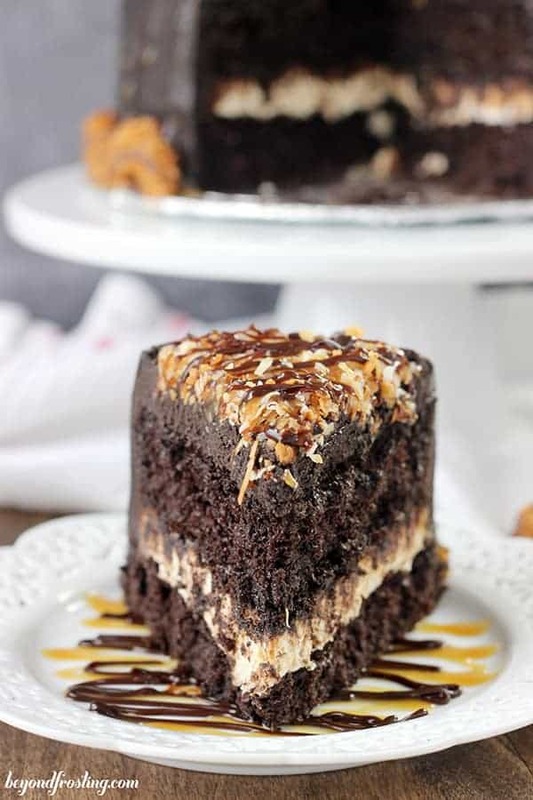 This chocolate cake is filled with a decadent coconut caramel cream cheese and frosted with a fudgy dark chocolate buttercream. 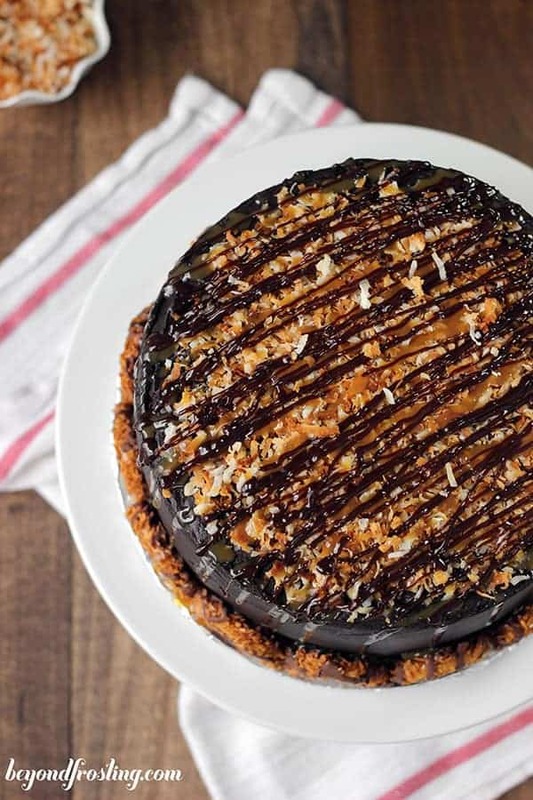 It is piled high with toasted coconut and drizzled with caramel and chocolate. You know it’s going to be a good week when samoas are involved. If you don’t believe me, I have 25 samoa recipes just waiting to prove my point. That means plenty of toasted coconut, caramel, chocolate and more chocolate. The Girl Scouts are out and about on street slinging those wonderfully addicting cookies and I am sitting back trying to resist the urge to eat an entire box. The only way I can avoid eating a whole box is by using them in a dessert. 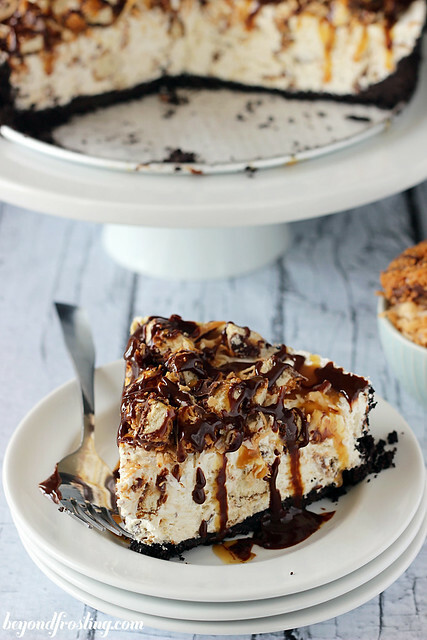 This Sinful Samoa Cake could not be any more decadent. 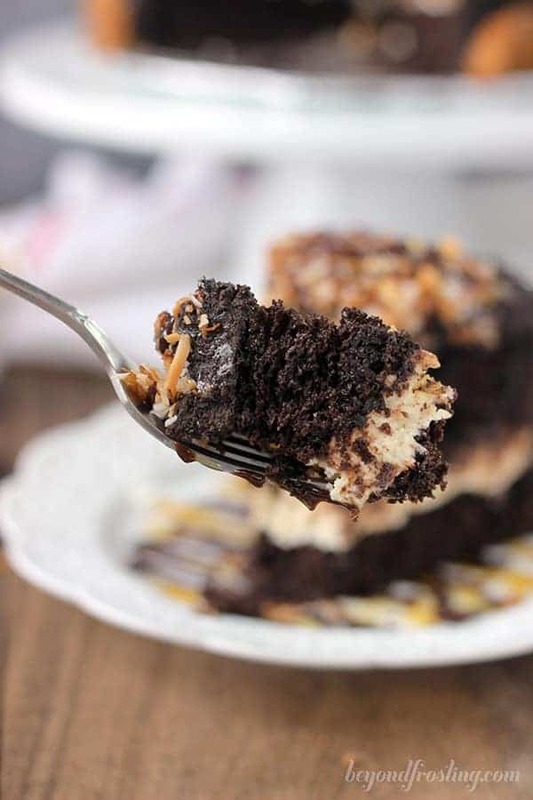 You start with a basic chocolate cake, then layer in coconut caramel cream cheese. The cake is frosted with a rich, fudgy dark chocolate buttercream. 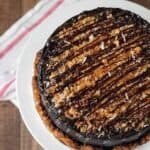 I couldn’t think of a better way to top this cake then with a pile of toasted coconut slathered in more chocolate and caramel. 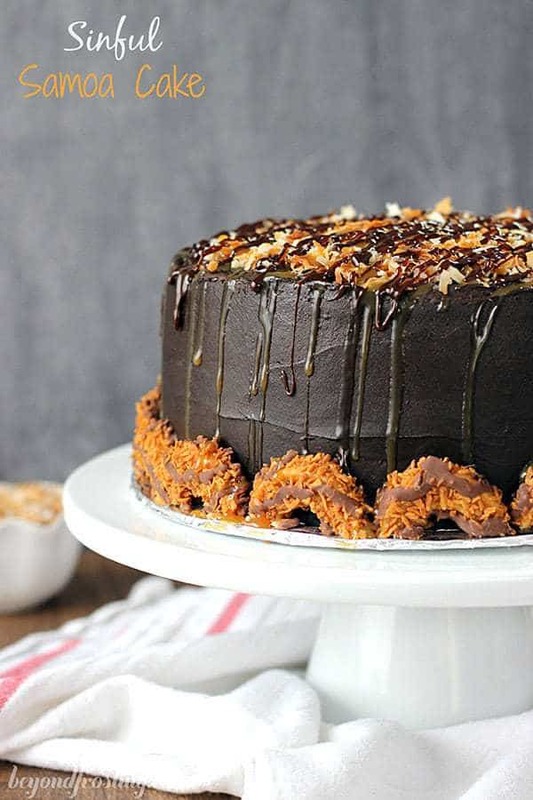 I didn’t originally set to out to make a samoa cake; it just sort of happened. I am SO glad that it did. I almost couldn’t wait long enough to get through my photo shoot to take a bite. Let’s break it down. The chocolate cake recipe should be your favorite chocolate cake. I didn’t do anything special, I just used a box of my favorite cake mix and made some alternations. When I do bake from scratch, I always make my Moist Chocolate Cake Recipe. 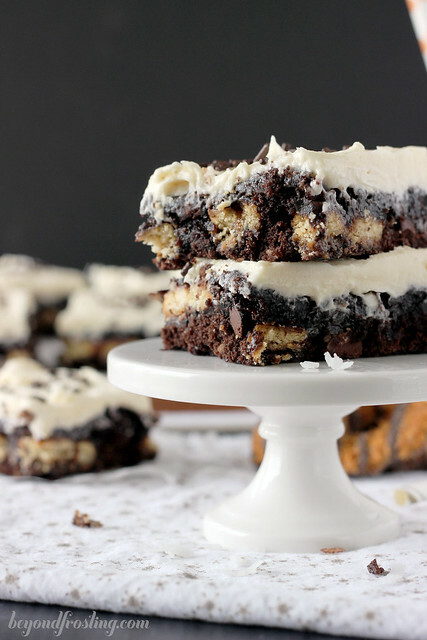 It’s light and fluffy and seriously THE BEST! I really wanted to incorporate a “cheesecake” element into this cake, so I decided on a caramel cream cheese filling. The softer the cream cheese, the easier it is to spread on the cake. I wanted to add a bit of texture to the cheesecake, so I mixed in a cup of toasted coconut. The fudgy dark chocolate buttercream is made with Hershey’s Special Dark Cocoa Powder. Now you can use any cocoa powder of course, but I always prefer dark chocolate. It is sweetened so you don’t get such a bitter taste. You could definitely dig into that buttercream with a spoon. While the frosting is still soft, start to pile the toasted coconut on top of the cake. Save a little bit to garnish at the end. Then I drizzled this with caramel sauce and fudge sauce. I keep jars of caramel and hot fudge sauce in my refrigerator. You should heat up the hot fudge so it’s warm but not too hot and then drizzle over the cake. Since there is a layer of cream cheese, this cake should be kept refrigerated. If you try to cut it straight out of the refrigerator, the frosting will be firm. So I like to let it sit on the counter for about a half hour before cutting into it. It’s hard to wait but I promise it is worth it. 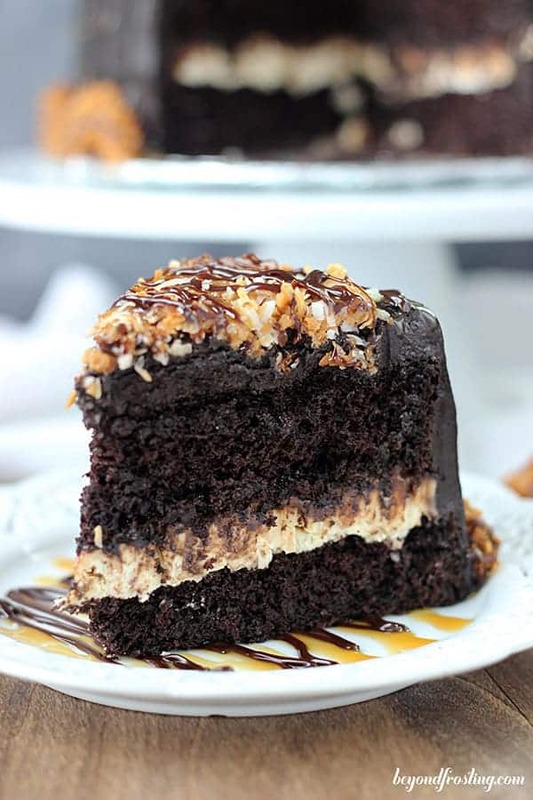 This chocolate cake is filled with a decadent coconut caramel cream cheese and frosted with a fudge dark chocolate buttercream. 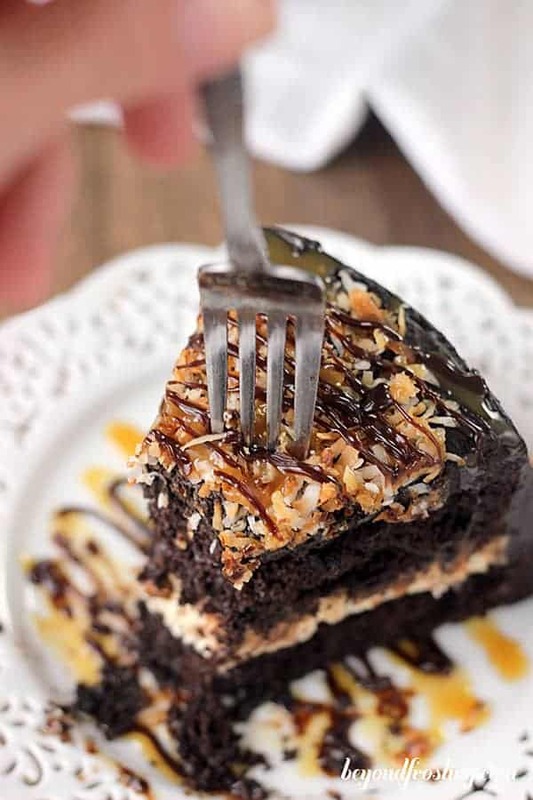 It is piled high with toasted coconut and drizzled with caramel and chocolate. Preheat oven to 350°F. Grease and flour two 8” pan. Line the bottom of the pan with parchment paper (optional). Combine cake mix, cocoa powder, vegetable oil, eggs, sour cream and vanilla extract. Mix thoroughly, turning the batter over to mix.Divide batter evenly between pans. Bake at 350°F for 22-28 minutes or until the center has risen. Insert a toothpick into the center of the cake and if the tooth pick comes out clean, the cake is done.Remove from oven and all to cool completely. While the oven is still on, toast 2 cups of sweetened coconut until lightly brown 10-20 minutes. It is best to toast on a baking sheet lined with parchment paper. Once cooled, cut the dome off the top of the cake so the cake is flat on top. Freeze for 15-20 minutes. Allow cream cheese to soften to room temperature. Beat on medium high speed until light and fluffy. Then add the granulated sugar and continue beating until smooth. Slowly add caramel sauce and heavy whipping cream. Beat on low speed until liquid is mixed into cream cheese and increase speed to medium-high. Beat for another 60 seconds until light and smooth. Add toasted coconut and mix into cream cheese. Layer caramel cream cheese on top of the bottom layer of cake. Put second layer on top and freeze for 20-30 minutes. Allow butter to soften to room temperature. Beat on medium high speed until light and fluffy. Add cocoa powder and beat on low speed until incorporated. Increase speed to medium high and beat until cocoa is mixed into butter. Reduce speed to low, and slowly add powdered sugar, one cup at a time. Alternate with heavy cream and vanilla extract. Once powdered sugar is incorporated, increase speed to medium high and beat for 1-2 minutes until light and fluffy. Remove cake from the freezer and frost the outside of the cake. Top with toasted coconut and gently press on top the top of the cake. 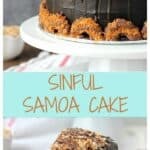 Cut Samoa cookies in half and align along the bottom of the cake. Heat hot fudge sauce for 30 seconds and stir. Drizzle top of cake with hot fudge and caramel sauce. Keep cake refrigerated. Remove from the refrigerator 30 minutes before serving. Cake recipe adapted from The Cake Mix Doctor. If using two 9″ pans, baking times will be altered accordingly. Please watch coconut carefully- baking (toasting) times will always vary depending on the quality and moisture in the coconut and oven temperature. Hi Amy, I am so sorry. I can’t imagine with all the chocolate and caramel that the flavor was bitter. Do you know if it was the filling that was bitter or the cake itself? This issss sinful….could I get away with purchasing frosting or would that ruin it??? Hi, The girl scouts are out in force & really want to make this but my question is, how many boxes does it take to go around this beauty of a cake ?? I need to get the cookies asap before they go away ! Recipe looks divine! What size are the 2 cream cheeses please? Thanks for the great recipes! Hi Belinda- These are 8 oz packages. Thanks for stopping by! 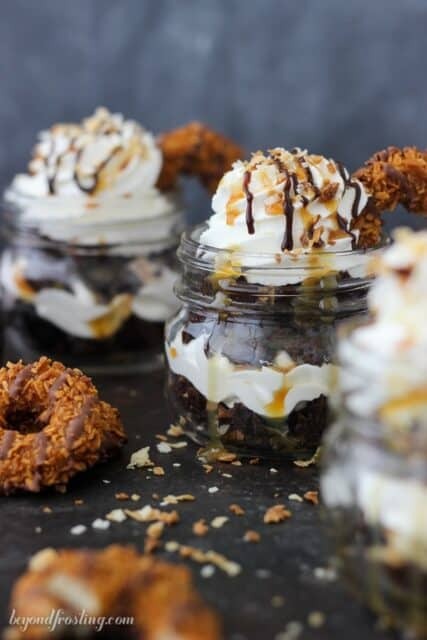 I was very excited to try this recipe because I LOVE Samoas!! I was disappointed that the actual cake was a wee bit dry. I followed the recipe to the letter, so not sure what went wrong.